Tales from a country Grandma: A happy hooky holiday! What a wonderful surprise I had the other day! It was a spectacularly warm and sunny day, and I returned from work with the intention of having a less freezing/wet/windy/foggy walk than usual with my lovely dog. I must admit walking the dog every day has been somewhat of a challenge this winter as the weather has been simply awful, but she enjoys it so much, and I always feel so good when I get home....anyway, I digress! I got in to a message from my darling daughter - she had popped up to Wowo campsite at a farm near the Bluebell Railway, to stay in a shepherd's hut, and asked if I would like to join her. Well, having made pies for 6 hours, and looking forward to my 'weekend' - a couple of days of nothing, I had to think about it. For a millisecond!! So, around two hours later, the dog was walked, I had asked my neighbour to look after her and my chickens for a day or two, I was packed and winging my way to another adventure. Packing was....well....different! My major decision wasn't what clothes to take (none - just what I was wearing plus undies and socks!) but what colour wools to pack! A relaxing couple of hours crocheting was definitely on the agenda, and I couldn't seem to make my mind up what I would make. I am halfway through making a set of Russian dolls, but thought something a little simpler would be better, so packed lots of reds and pinks to make roses for a summery flowery wreath I have in mind. 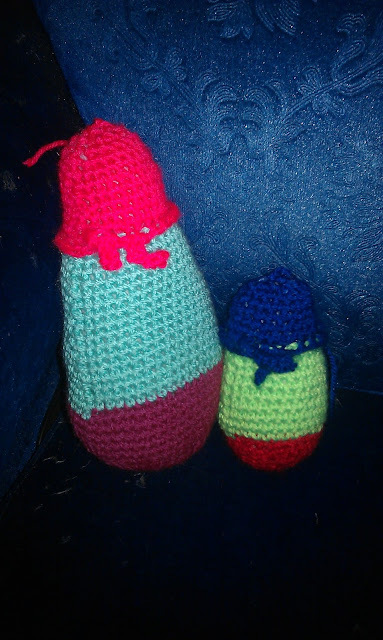 Plus, I couldn't resist it -I took my half made Russian dolls! I may re-make the second one as it looks a bit teeny...I will see how I feel when all four are done. I arrived at my destination, and although it had been 8 months since we stayed in the shepherd's hut, it felt like I had never left it! 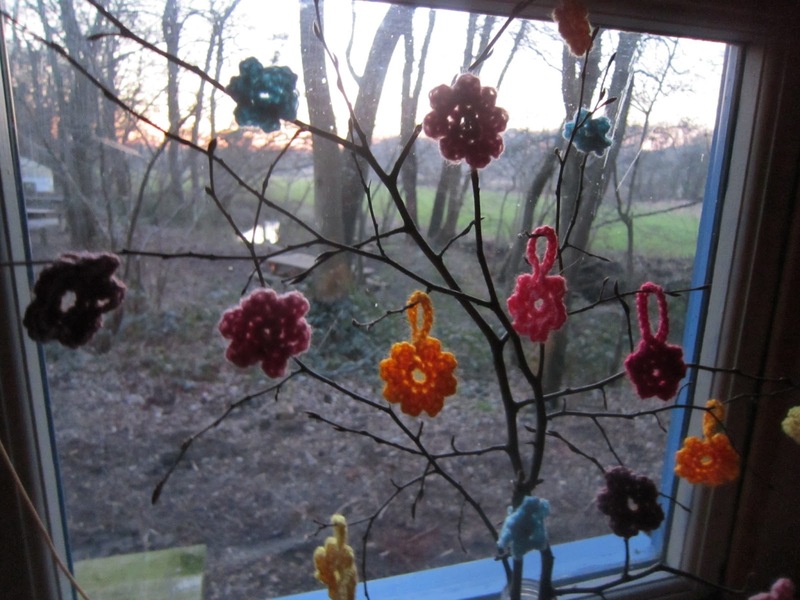 We decided to have a meal in a local pub, then came back and wiled away the evening relaxing and basking in the warmth of the log burner, and even managed to crochet a few teeny flowers for the spring tree, by candlelight. In the morning when I woke, I was greeted with a freshly cooked bacon and egg sandwich brekky, and we ate outside by the stream. Astonishing to think of the howling gales and driving rain we had encountered here last June - it was really mild and the sky was so blue - and it's only February! 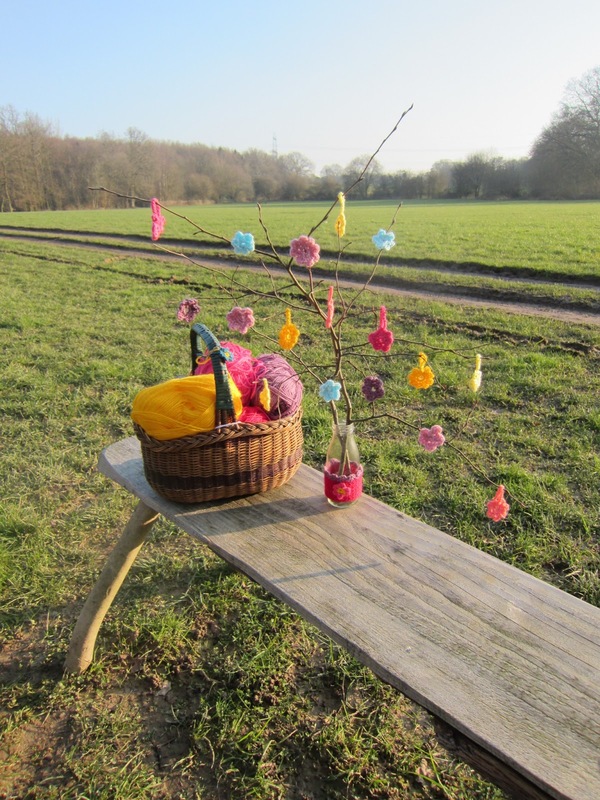 We found a sunny spot in the field, and took our wool with us and set up for a day finishing the crocheted twigs. We had been given a wide necked bottle for the display at the pub the previous night, and my daughter made a little cover for it, which looked very cute. The day was completely idyllic, and the time flew past. Before we knew it, the sun was going down and it was getting chilly again. 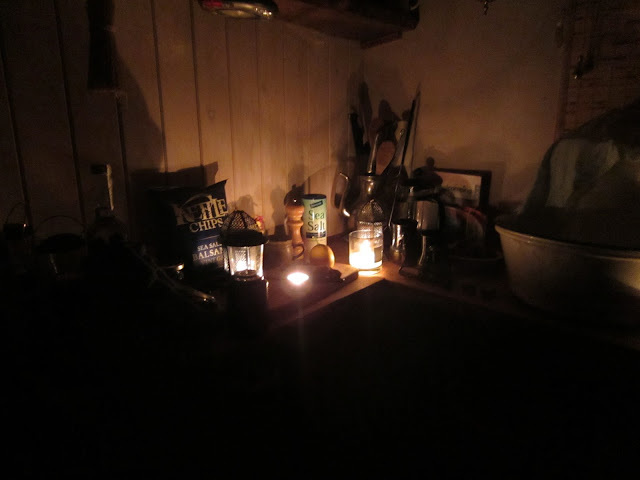 So we returned to the warmth of our little hut, and apart from a quick dash to the compost loo, we were toasty warm again! In the evening, we popped out for a delicious takeway curry, then sadly, after a lovely evening, tucked up in bed for our final sleep in the hut. We did have our lovely twigs to enjoy for the evening though. The next morning we left to return home, but gave our flowers to the lovely lady who runs the campsite. They were always intended for her, but we enjoyed both the making and looking at them too for a while! Bye for now Wowo, bye shepherd's hut, bye sunshine, bye stream, bye twigs.